Have a part to extrude hone in Santa Ana CA? We can meet your exact specs, guaranteed. Relatively few metal parts come right off the assembly line in perfect condition. Fortunately, imperfections large and small can be removed using extrude honing, aka abrasive flow machining. Whether you have one exhaust manifold for your hot rod to extrude hone in Santa Ana CA, want help putting the finishing touches on a 3D sintered prototype, or need to remove the EDM recast layer on an entire run of parts, Extrude Hone AFM can help. Extrude honing works just like you might guess from the name: an abrasive media is extruded through the workpiece to hone the metal surfaces as it passes by. 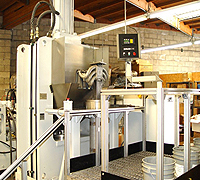 In essence, extrude honing produces controlled erosion, grinding away imperfections. The technique can be used aggressively to enlarge passages or delicately for fine polishing. What metals can I extrude hone in Santa Ana CA? The answer to this question will depend on what you want to extrude hone in Santa Ana CA and how fast you want to remove material from the workpiece. However, the process is certainly faster than hand finishing, porting, or deburring. We have a huge stock of polymers and abrasive grits on hand so that prepping the media won’t add any delays to the process. For a quote on your project, please contact us online or call (562) 531-2976. Be sure to include a description of the part you want to extrude hone in Santa Ana CA and the improvement you need to achieve so we can provide an accurate quote.